This really isn’t that hard, people. Just last year, Snapchat apologized for adding an offensive Bob Marley selfie filter to its stable. Now, FaceApp—the silly photo editor you probably downloaded in March and totally forgot about—has outdone Snapchat by throwing in options for people to virtually switch between multiple races. No. Don’t do this. Normally, FaceApp is used to make friends do a smile in a sad photo, or add old man wrinkles to a fresh-faced twentysomething. In April the company added a “hot” filter that everyone quickly realized just attempts to make everyone look whiter. The company subsequently blamed its shoddy AI that was programmed by humans. 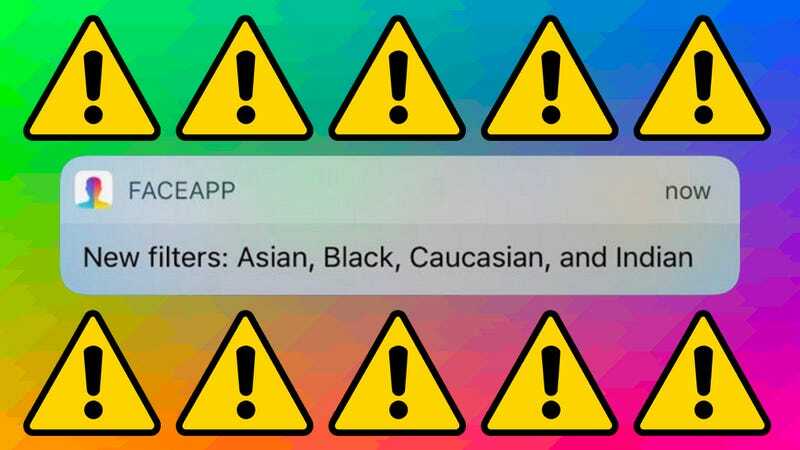 The filter was renamed “spark” in order to “exclude any positive connotation associated with it,” FaceApp CEO Yaroslav Goncharov told The Guardian. It was subsequently removed altogether. This shouldn’t have to be explained, but no matter how well “designed” these features are, they perpetuate stereotypes and call back to an era when dressing up as caricatures of other races was a common form of comedy. Would you wear blackface as a Halloween costume? Would you do it and expect to get through the night without being punched in the face? Selfie app makers just have to follow that guideline and their lives will be much easier.